Enjoy this cheesy vegetable soup that's as easy as it is velvety. 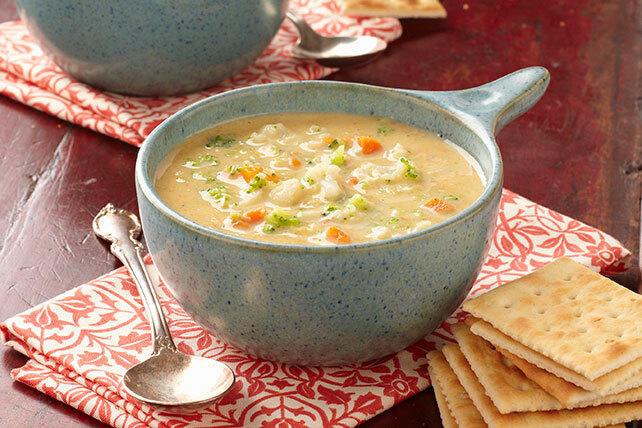 This vegetable soup uses prepared broth, a package of frozen veggies, & cubed VELVEETA. Bring vegetables and broth to boil in large covered saucepan on medium-high heat; simmer on low heat 10 min. or until vegetables are tender. Remove from heat. For a smooth consistency, soup can be pureed in a blender or food processor, or directly in the pan with a hand or immersion blender.